The campus offers limited (20 spaces) and low-rate parking for visitors from $2 per hour or $10 per day in Lot 10002. This lot is located on the northeast corner of 7th Street and Van Buren Street. There is a pay-meter provided in this lot for visitors. Parking on holidays, weekends and after 5:00 p.m. on weekdays is free, unless the lot has been sold for a special event. 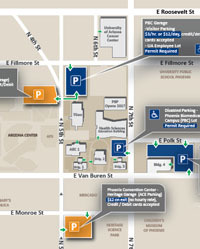 There is also visitor parking available in the PBC garage [555 E. Fillmore, Phoenix, AZ 85004], located at the southeast corner of 5th Street and Fillmore (entrances are on the south side of Fillmore and the east side of 5th Street). The rate is $3 per hour or $15 for the day. Contact Standard Parking, 602-252-7222, ext. 4, to inquire about validation. Arizona Center parking garage for $3 per hour (for the first two hours) or $18 maximum daily rate. For questions related to parking, please contact the parking manager at 480-356-9139. After the first two hours, the rate will go up by $6. Heritage Square parking garage $12 flat rate, unless you receive validation. Contact ACE Parking, 602-307-5096, to inquire about validation. Metered parking on 5th Street for $1.50 per hour. *If events are happening in or around the downtown area, rates may differ. Please review all parking costs upon entrance to the facility. For information about parking rules, permits, or other parking related topics, please contact PTS Customer Service at 520-626-PARK (7275) or visit university parking and transportation services. Bus routes and Metro Rail schedule.